Natural Living Guide to Supplements, Superfoods, and Personal Care. Early blooming flowers are a classic sign of spring. 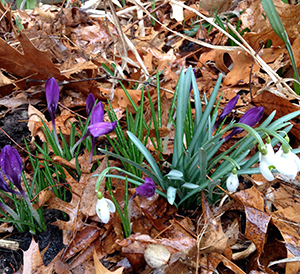 Many places that were under snow a month ago, now have crocuses blooming and daffodils sprouting. And strawberry season has started in the warmer states. In honor of these great ingredients, we’re bringing you a great smoothie recipe. Perfect Three Grass Blend is gluten free, protein rich sprouted grasses that pack a nutritious punch. Baobab powder adds antioxidants and loads of fiber. Coconut oil adds all the healthy fats that round out this healthy breakfast smoothie. Combine all ingredients except ice in a blender. Blend on high for 3-4 minutes. Add ice and blend another minute or so until smooth. This filling smoothie has a whopping 17.4 gm of fiber per batch and makes about 2 good size servings. Bone Broth: Comfort food that’s so good for you! Conquer chronic constipation with these helpful tips.